Join the discussion on our forums! Come discuss Omega Medic over in our dedicated Omega Medic discussion topic. Great synergy with Auchenai Soulpriest!!! meh... doesn't excite me but could be playable maybe? ...doubt it, if you've made it to turn 10 vs aggro you're probably in pretty good shape already. If you're on turn 10 vs control the healing doesn't matter. Would you play a three mana spell that restores 10 health as a replacement to Greater Healing Potion? I would. I find it a pretty good way to evaluate minions by pretending they're a spell, seeing how much the card text is worth, and seeing whether the body helps make up for the cost. This is simply a great effect even as a three mana spell, and it comes with a body that you wouldn't mind throwing down on curve. I thought this was a really nice card until I saw the other Omega cards. 2x 4/5 for 5 mana is much better than just getting healed by 10. Which only has effect if you have actually been hit by 10HP. This is the same struggle as priest always had with it's hero power. It's useless if you are at full health. Neither one of these cards are to be played before turn 10 though. With the 2x 4/5 for 5 mana I was talking about the battlecry effect only, due to comparison reasons between the cards. Well rounded minion. It's a pity that it might not get used. I think it will never see play. It has good stats and a nice effect in the late game but Priest has much better cards and no free slots for this one. Maybe in Odd Priest, at last. 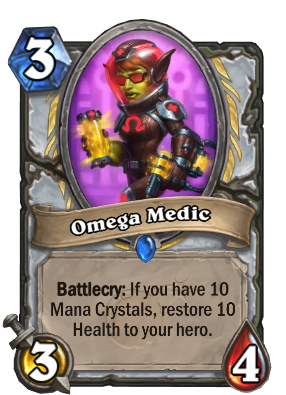 Omega Medic is fine against some matchups like tempo mage but not much else. Quest aside, Priest has THE WORST healing ATM of all control decks, shaman can heal 12 for 3, druids can get 12 armor for 4, Paladins can Lifesteal all the way back up and even warlock has decent healing options, priest got nothing going on mate. 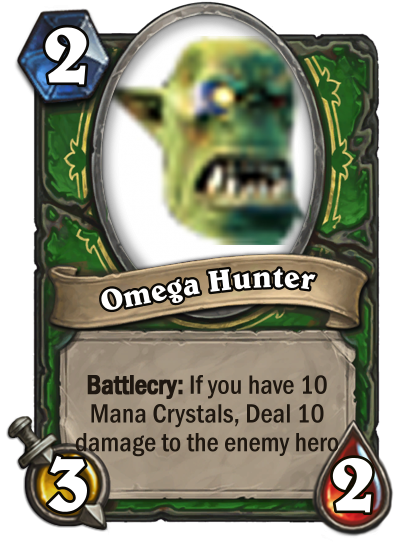 Healing 10 health is good, 3 mana 3/4 stat line is good otherwise. Usefulness varies but still pretty strong. Looks like Twilight Darkmender. Good stats, good battlecry but not enough.